When you set out to build a business with a competitive advantage, you begin by deciding how to compete. You make a choice about where you want to play. Clear business strategy paves the road for growing the business you visualized when you took the plunge and decided to become an entrepreneur. The reality of small business is that most entrepreneurs don’t have a strategy. How do I know this? From both my own experience and watching many hard working people trying to be all things to everyone. This is the opposite of strategy, it’s chaos. Strategy defines what your business will do, it also defines what you will not do. Which customers you can’t help and which products or services you don’t provide. Most entrepreneurs have a technical skill; it could be doing tax returns, making pizza or selling cars. They can perform the production or service, but that is only one small part of creating value to earn money. Running a focused business is a different skill, most entrepreneurs find this out too late. I hope this ebook on business strategy finds you at the right time and acts as your road map to entrepreneurial success. 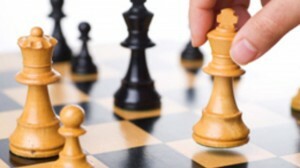 We offer a clear definition of strategy so entrepreneurs begin thinking in terms of the choices needed to succeed. Your industry provides value for customers willing to pay for it. Learn how to determine the factors that determine how much profit value your company can capture. Most entrepreneurs compete to be the best. It sounds great but in my experience it’s a plan that leads to frustration. True business strategy is about competing to be unique. While it’s absolutely true you need to understand the best practices in your industry and how your competition operates, you absolutely do not want to mimic what they are doing. The very definition of strategy is about making deliberate choices about who you serve and how you can best organize your resources and activities to create value. Do you ever tell a potential customer no? Is your business configured to help someone specific? Good competitive strategy helps make choices easier. For your business strategy to be effective, your activities must be purposeful. Strategy forces you to make deliberate choices about how you create value to earn money as a company. A well thought-out strategy is built around positioning your company where you can be unique in a way that customers value. You need to make a choice; are you going to be the cost leader or do you provide something different to justify a premium price? Your entire business should be built around this decision.